The #1 resource for accurate backtesting since 2009. Simulate trades that have the same conditions as your live trades. Amazing results in Metatrader 4 backtesting. Acquire free historical tick data for Forex and CFD symbols from multiple quality sources. Store all your tick data in a single location, manage it in one place yet have it ready to use across all your terminals. Run accurate backtests directly without manually handling files. Access all advanced settings easily. Export the data to any trading platform. 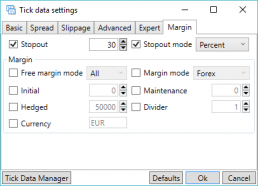 Metatrader 4 backtesting uses prices that are randomly generated from bar data. By a process of interpolation, it uses the bar price data together with the tick count to generate the prices for each bar so that they start at the bar open price, touch the bar high and low, ending at the close price. If a position has both its SL and its TP within a bar's price range, it's a coin toss whether it will hit stop/loss or take profit. With the Tick Data Suite, actual price ticks are used. Nothing is left to chance - your backtests will use the prices that were historically traded and recorded tick by tick, oftentimes more than once per second. Tick Data Suite is committed to providing the best possible simulation precision in backtests. 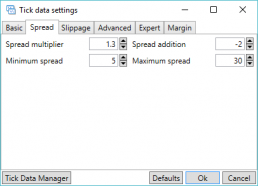 Where traditionally Metatrader 4 only allows backtesting with a fixed spread, TDS goes one step further and lets your backtests use real, variable spread, just like most brokers are offering nowadays. You can even configure it to make it resemble the spread of your live account. 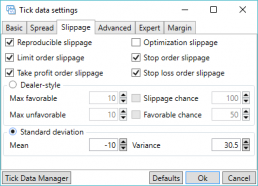 Tick Data Suite even goes as far as making it possible to simulate slippage. Ever wanted to change the backtest leverage? Or perhaps the minimum lot, the commission or the stopout? How about the GMT offset or the daylight saving time configuration? 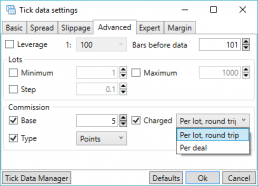 With the Tick Data Suite, it is now possible to configure all the above and more: swaps, stop levels, margin details, you name it - TDS has it.